St. Llewrwg’s church has over the last 155 years seen much history and many changes, but remains today the centre of the community serving Hirwaun and the surrounding villages with all its needs. The interior, now refurbished with chairs instead of pews (which can be rearranged to suit all events), is comfortable and welcoming to all. Worship and services are held on Sunday, with Sunday School for the children in the morning. Wednesday has a well attended service in the morning, and all are welcome. Organisations i.e. Mother’s Union, Mother’s Guild and Men’s Fellowship meet monthly and a Tea Dance meets every week. In July 1971 a church magazine was produced ‘ The Crucible’ – which truly is THE parish magazine where all church details are available and everyone can advertise and share information. More information available from church members. The dedication of this church to St. Lleurwg, Hirwaun (or Hirwain as it was originally known) is unique – there is no other such dedication in the whole of the province of the Church in Wales. Lleurwg (pronounced Thly roog) is thought to be the Welsh name for Lucius. Lucius was a 2nd Century English King living in southern England although little is known ofhim. His Feast Day falls on December 13th. The church was built in 1858 and dedicated in that year by the Bishop of Llandaff. It is remarkable in that it has a gallery which is untypical of an Anglican church, (however another church in the Deanery – the Church of St. Donat’s at Abercynon is similarly endowed) The churchyard is approximately one acre in size and one early photograph shows no trees in the vicinity. The church appears to be the gift of the Trustees of the Marquis of Bute. The church at that time is described as being perpendicular Gothic and comprising of nave and vestry – the chancel window having three stained glass windows (there appears to be no dedication for these windows). The bath stone bell turret was incorporated at this time and the roof was said to be built of Bangor slate. The Pulpit was a wooden structure and entered from the vestry. The total cost of the building was £1,199 excluding the cost of furniture and East window. There was no heating or lighting at this time! The music was provided by an harmonium. February 20th 1884 saw the Bishop of Llandaff visit the parish again this time to consecrate the thoroughly restored organ. An organ chamber and chancel had been added and the seating capacity was increased to 300 worshippers. The account recorded that “from being one of the plainest it is now the neatest and most substantial church in the parish of Aberdare”. 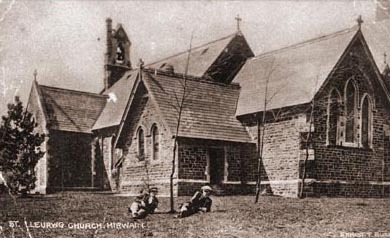 It remained the parish church of Hirwaun district, but remaining within the Aberdare parish, until November 29th 1886 when the Bishop again travelled to Hirwaun to induct the Revd. W. Rydderch as the vicar of the new parish of Hirwaun. A photograph held in the parish probably of the early 1930s shows the church as having no screen, a simple wooden pulpit and no ornate font. As time went on a screen was erected in 1930s and later an ornate pulpit and matching font was donated to the church. All windows with the exception of the West windows have been illustrated.